It is on everyone's lips today: Yahoo! announced an acquisition of me.me for its social platform meme. Of course, me.me looks so much better than meme.yahoo.com. And maybe even better than its.you. Let's give it a bit of buzz... The question is, will it ever catch up with Facebook, Twitter, or Google to start with? Facebook is full of meme names already, a band – http://www.facebook.com/pages/MEME/214909210288 and a startup club – http://www.facebook.com/StartupMeme to mention some. Apparent.ly me.me is targeting Indonesian market. description The server encountered an internal error (Failed to execute statement: java.lang.RuntimeException: Exception waiting for value) that prevented it from fulfilling this request. description The request sent by the client was syntactically incorrect (null). MEME is so popular that someone has registered MEMEMEMEMEMEMEMEMEMEMEMEMEMEMEMEMEMEMEMEMEMEMEMEMEMEMEMEMEME.ME – yes it has 30+1 times “ME” in it. Subject: Important: Meme will be discontinued on May 25, 2012. Unfortunately, the time has come to say goodbye to Meme. As part of Yahoo!’s commitment to delivering Web content and tools that matter most to people, we are reprioritizing our portfolio so we can focus on our core strengths and new innovations. You don’t need to take any action. But if you want, you can export your posts or delete your account. 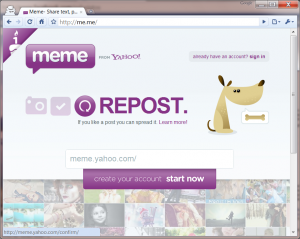 – Your Meme blog will be available up to May 25, 2012. Until then, you can go to your posts and save to your computer any images that you want to keep. You can export all the text and images from the posts you created by going to the “Settings page” and clicking on “export my posts”. You can also go to the Settings page to delete your account. – On April 25th, Meme will enter “reduced functionality” mode. This means no more new accounts, new posts or new comments will be allowed. The Meme API will stop accepting Inserts and Updates. You will still be able to access everything, export your blog or delete your account. – On May 25th, we will shut down the site and all Meme URLs will become inaccessible. 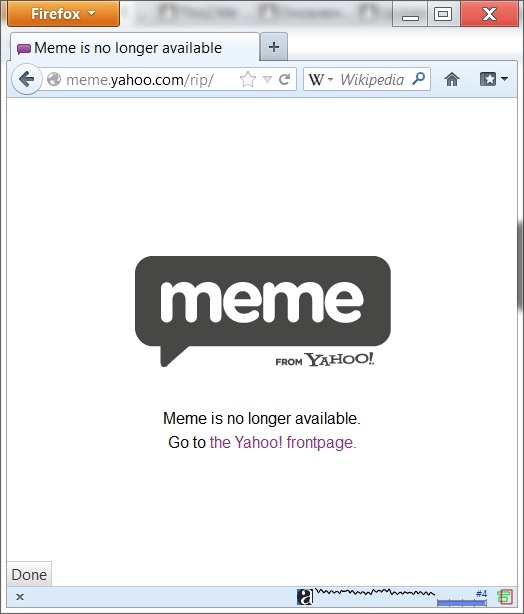 From this point on, you will not be able to access Meme anymore. Your Yahoo account remains unaffected. We thank all the users that were a part of this community and hope to see you around other Yahoo! products. In the end of July, the domain name came back to the registry. That was probably part of the development deal.